Judging from the number of people cosplaying from the series at anime conventions, D.Gray-Man already has quite a fan base in America. Set in the fictionalized end of the 19th century, a sorcerer known as the Millennium Earl offers people an opportunity to bring dead loved ones to life. The problem with this deal with the Devil is that the deceased resurrect as Akuma - maniacal killing machines capable of taking human forms - who join the Millenium Earl's army in his quest to end humanity. 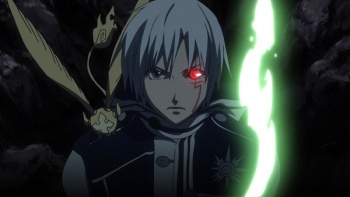 The Exorcists of the Black Order vow to prevent the Millennium Earl's plans from reaching fruition and lending a giant helping hand for the Black Order is the show's main protagonist Allen Walker. Each main story arc has an engaging plot and intensive combat while occasional filler episodes set in the Black Order serve as humorous asides. The English dub is passable and the dialogue is very similar to the English subtitles. D.Gray-Man borrows several traits from other action anime such as constant battles with a never ending supply of cannon fodder enemies, the introduction of an evil organization whose powers rival that of the protagonist's organization, and even the occasional giant robot running amok, but D.Gray-Man employs a visual style that makes it stand out among its peers. Each Akuma creature starts out the same but evolves into a unique nightmarish design based on its attacks and environment. Like snowflakes, no two Akuma are alike. The Millennium Earl himself looks nonthreatening as a portly gentleman clown, which makes him even more vile when he executes his evil plans. It's also impressive how D.Gray-Man gets the viewer to sympathize with the victims of the Millennium Earl. Learning of the Millennium Earl's modus operandi, I initially thought each victim was a gullible idiot for accepting an offer to bring back the dead - I have yet to see a story where reviving the dead resulted in a happy ending - but the anime does a good job of portraying the grief and desperation over the loss of a loved one and leaves the victim vulnerable enough to accept such a demonic deal. In addition to unleashing the Akuma infestation, D.Gray-Man throws a lot into its first season by introducing various members of the Black Order, the evil Clan of Noah, various character histories, and MacGuffins known as Innocence. Most of the story concepts take a few episodes to comprehend before accepting as canon. While one might expect all of these expository elements and characters to set the stage of an explosive finale to the first season, the end of the 26th episode and first season of D. Gray-Man only teases with promises of bigger and more intensive things to come in subsequent seasons - which is starting to become my new pet peeve in anime. A season of an anime series should stand on its own complete with its own exposition, climax, and conclusion, and the trend of longer running anime series like D.Gray-Man ending a season with a cliffhanger feels like a desperate attempt to ensnare audiences with promises of a story instead of actually telling one. It makes the previous episodes feel like a waste of time knowing there is no closure in the end. But on its own, the first season of D.Gray-Man is an entertaining treat with a well-developed main character, excellent artwork, and an interesting setting. I wish I could have asked D.Gray-Man fans and cosplayers a few more questions while watching the show. Why do the Akuma bother disguising themselves as humans when they have enough firepower to kill everyone in town before the Black Order can react? Despite wearing ornate uniforms designed to attract Akuma attacks, why do most towns initially have no idea about the Exorcists of the Black Order or Akuma? How do Komui's giant robots employ current generation fictional mechanical technology instead of 19th century fictional steampunk technology? And my biggest question: Why is the series titled D.Gray-Man in the first place? Bottom Line: With an interesting premise and a good lead character, the first season of D.Gray-Man sets the stage for something epic but is yet to deliver. Recommendation: D.Gray-Man is worth a viewing, but be prepared to watch a lot of episodes if you expect closure from the series. Tom Tonthat would like to thank the D.Gray-Man cosplayers he met at Anime Expo who explained the numerous differences between the short statured Allen Walker and the short statured Edward Elric from Fullmetal Alchemist. The first season of D.Gray-Man spans 26 episodes and is released on two box sets, each containing 13 episodes.